For more than just a few years polish black / death panzer Behemoth has been a driving force if it comes to taking extreme metal to even more extreme levels. Especially 2004’s ‘Demigod’ and most lately 2007’s ‘The Apostasy’ cemented this status without any doubt. The band has gained international acceptance by recording more than just strong albums throughout the past 14 years and being an unstoppable power on stage, relentlessly devastating venues all over the world. Enter 2009 the monster called Behemoth is one of the hottest artists in extreme music having a tremendous fanbase throughout the globe. 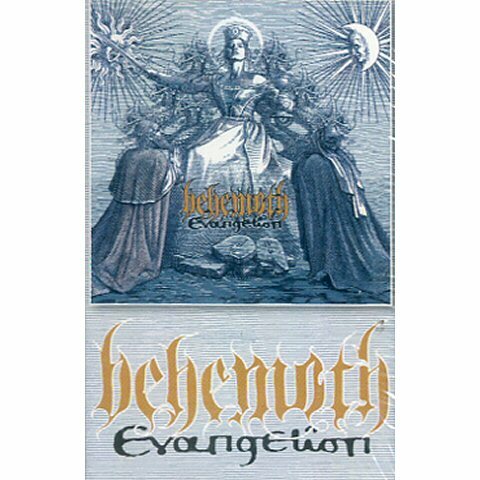 Now, with their ninth album, ‘Evangelion’, Behemoth shows what they are really capable of. 9 tracks full of hate and insane brutality that pushes both the band and the listener to their limits. Frontman and band leader Nergal made the impossible happen by melting the sheer violent Behemoth vibe with epic moments and even more diversity which makes ‘Evangelion’ so special in the bands successful career. Although the polish trio has always had their fair share of black metal within their unique sound, ‘Evangelion’ comes up with even more of it, going back to the bands blackened roots of raw and grim darkness. Besides having the album mixed by the legendary Colin Richardson (Machine Head, Kreator) it shows another side of Behemoth that has been buried for a long time: the concluding opus ‘Lucifer’ is impressively presented in polish language – a thing that has been done on ‘Pandemonic Incantations’ in 1998 at last. ‘Evangelion’ is not just a piece of music, another album you put in the player or somewhat of an easy listening event for it has so much more to offer with its whole concept – from the pure penetrating power and of the music to the impressive lyrics to the astonishing artwork, ‘Evangelion’ is without any doubt the perfect symbiosis of several aspects of art.